A Little Bit Here, A Little Bit There. I had originally planned to try to work on my new quilt some each day, the way that I did with the last one that I made. That worked out well; the piecing work never felt overwhelming and I developed a rhythm with it that gradually built until the top was all of a sudden finished. But there is a lot going on here these days. Work on the book. The kids and I moving from one house to another. I started a new teaching job the end of last week and now it is school vacation for the big kid. So, not so much with the quilting and the knitting and the other non-required activities. Just a little bit here and a little bit there, when the pace of things slows enough to allow it. The Book I'm Not Writing. If I were going to write a book about quilting,* it would be called something like The Lazy Girl's Guide to Making Quilts and Stuff. It would be about two pages long, and both of them would be dedicated to detailing the dangers of rotary cutters. Because I'm pretty sure that the rest is all just unimportant details. Right? * I am not going to write a book about quilting, so don't worry. As I slowly dip my toes back in the waters of blogland, I'm finding that I am getting an ever so slightly increasing number of emails wondering just where the next issue of Alphabet Glue might be hiding out. The answer is, of course, in my brain. And a little bit on my harddrive. But you all have been sweet enough to wonder (thank you for that!) and so I thought I should return the favor by offering a little update. With this fall and winter having so very much to offer in the Big Life Changes Department, I have to admit that my inspiration for things like whimsical science experimentation and paper folding took a bit of a hit. But a new routine is beginning to take shape, and I found myself missing the creative work of putting the magazine together every couple of months. Knowing that there are still going to be a fair number of ups and downs in daily life around here, I felt ill prepared to do much of anything on my own and asked Dawn if she might be willing to help me knock out Volume Sixteen of Alphabet Glue. She said she would indeed. And thank goodness- because she is my own personal taskmaster and we are now on track to have a great new issue ready for you all very soon. I'm hoping it will be ready for launch in about a week. I'll keep you all posted, and in the meantime, I hope that you will accept my true and honest gratitude for letting me know that you'd like to see another issue of The Glue land on your virtual doorsteps. It means quite something. Really. 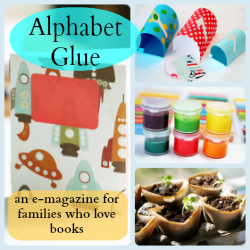 Alphabet Glue: Volume Fifteen is Here! Good Monday, all! It was a busy weekend, and I have high hopes for toddler napping and couch knitting in the next little while here, but I did want to poke my head in to let you all know that Volume Fifteen of Alphabet Glue is officially available. This newest installment is full of all kinds of good stuff related to the height of autumn and the coming of cooler weather and shorter days. You will find fun projects and printables on such themes as natural history, weather science, and bringing the outdoors in as the seasons shift. Hop on over to the shiny new Volume Fifteen page on the Alphabet Glue site to find out more about this issue, to get a sneak peek at some of the projects, and to download a copy of your own! As it turns out, not so very much got done this week. Between Dan working truly insane hours at the hospital and both kids being sick, it just seemed wise to let a few things go and circle the proverbial wagons in an effort to stay sane instead. And, here is Friday. Hello. I guess that means we made it. I did want to share a couple of things before heading into the weekend, though. The first is that I have a new post up on the Sparkle Stories blog. On one of the days that she was home from school this week, Mariam and I spent some time adapting the baking soda clay recipe from the 2013 Summer Science Special so that it could be used to make paintable charms. You can find the instructions here. Also, to celebrate the fact that all things are going swimmingly over at the new blog, Dawn and I are hosting a fun giveaway. To get the details (and to enter) visit today's post. Alright, then. Off to try to problem solve the fact that the dog ate one of the toddler's only serviceable shoes this morning while I was upstairs and not being adequately vigilant.